Utforska Palazzo Vecchio, Florens imponerande rådhus, på en 1,5-timmars kvällstur. När solen går ner över staden, gå runt en gång fästningen med en guide för att höra historier från dess förflutna när det var centrum för florentinska makten. Beundra Hall of the Five Hundred bland andra rum utsmyckade med konstverk, och njut av utsikt över staden från slott och Arnolfo Tower. Förbättra upplevelsen med en "aperitivo" eller middag och blick ut över Piazza della Signoria när du äter. Nummer är begränsade till 25 personer. Uppgradera för en aperitivo eller middag på Piazza della Signoria-en sällsynt behandling. This tour was a bust. Guide showed up nearly a half-hour late, and used the larger group's valuable time giving repeated instructions to the 2 or 3 people who'd signed up for the optional dinner. Result was that we were rushed throughout, and there was almost no time for us to ask questions. Guide repeated the same generalities over and over, and didn't include things I would've expected, such as the exploration for hidden frescoes in the great hall. The tour begins in the Palazzo's courtyard with a history of the architecture styles and the history of Florence. From there, you make your way through the political history of Florence and its leaders and the rooms where important decisions are made. As you climb higher, you learn about Florence's rivalries with Siena and Pisa. You can also decide for yourself if Dan Brown's depictions in Inferno are accurate. The guide is thorough and happy to answer any and all questions. She took us around the first level of the tower to point out things that we could see from this particular vantage point and only left us when she was sure that we had all of our questions answered. We were able to spend another 30-45 minutes appreciating the view and climbing higher to see more of Florence. Excellent tour. We did not book the dinner option so I cannot comment on that. Our tour guide was both difficult to understand and did not share the dramatic and exciting history of the rise to power of the Medici's in a way that was captivating. Her knowledge of the art was very good, however. Palazzo was good , the guide was GREAT but we didnt get to go up the tower as it was over crowded - so waste of money., though the ticket remains valid for 6 months - we had return tickets next day .. so people buying this - be prepared to go back to go up the tower. The dinner is just downstairs in a restaurant , which was not the same idea i got when i see caption sunset tour with dinner we definitely didnt see the sunset even . Dinner was inside a restaurant not outside of the restaurant even food was ordinary - NOT recommended. Just book the palazo tour with the guide - thats enough. O Palazzo Vecchio era incrível, o guia tinha bastante conhecimento. 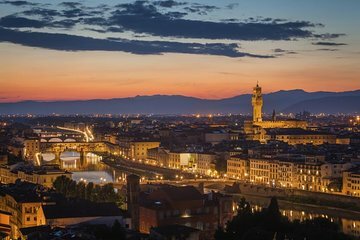 Já as muralhas são dispensáveis, você tem uma vista melhor e mais bonita da Piazzale Michelangelo, sobre a torre, não subimos. Nosso jantar foi em um restaurante na Piazza Della Signoria, foi muito bom, mas não há menu, é tudo surpresa. Eu não compraria com jantar novamente. Très belle visite intime mais malheureusement nous ne l'avons pas eu dans la langue commandée, vu le petit groupe. Palazzo Vecchio is a beautiful building and the opportunity to view Florence at sunset from the tower was great. We did get the impression that the tour was a bit rushed. Horrible Aperitivo experience! food not good got pizza bread olives and peanuts for 30...sad! for money would NEVER do that again! Stay away from this scam! Restaurant was very unwilling to help us. iThe tour guide was GREAT, and the rest fo the tour was good, except we couldn't climb the tower due to weather, which was pretty good and not bad at the time. no reason to close the tower. we did not opt for the apetivo. The guide dutifully picked us up outside the Gucci cafe and got our tickets .She showed us around the Vecchio place but conveniently forgot to mention that the tower would not be accessible because of a fashion event. Eventualy we requested the guard to let us up the tower which he did after he confirmed with the booking office downstairs . The guide took us up the tower and left us...that's it. We could not go further up the tower because of the event later in the evening . On return my wife visited the booking office and she was berated saying that the visitors were informed to visit the tower first as it would close early and then visit the palace rooms. But the View from the tower is spectacular and the tickets easily available at the booking office on the ground floor.